Read the ATV user manual together with your kid. Make sure that she or he understood the most important points. Before starting out, check your four-wheeler for possible technical damage or disrepair. Get your kid properly clothed and outfitted. The number one protective gear is an ATV helmet for kids or motorcycle sports helmet. Make sure it is certified by the US Department of Transportation or the Snell Memorial Foundation (there must be a proper label on the helmet). Also, a typical set of safety equipment includes gloves, sturdy over-the-ankle boots or shoes with deep tread relief, special outdoor clothing, a face shield or goggles. A long-sleeved shirt and long pants will protect your kid against abrasions, cuts and other injuries from trees, rocks and so on, as well as against moisture and dirt. Make it a habit for your kid not to sit on the ATV without putting on protective equipment. 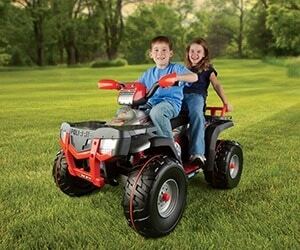 Do not touch the moving parts of the ATV, such as the propeller shaft or wheels, and instruct your kid accordingly. Use throttle limiters. Most mini ATVs are equipped with them. Otherwise, it is not difficult to install such a device, as it is nothing more than a screw limiting the movement range of the thumb throttle and can be easily adjusted to a safe level for your kid. Thoroughly instruct your kid on how he or she should behave during the ride. Explain to him or her why it is important to hold tight all the way and not get off or on the ATV until it is fully stopped. Don’t start training without plenty of open space. Nearness of obstacles restricts the time for reaction and can make your kid panic. Choose flat ground for the beginning. Hill-climbing is always a dangerous maneuver. 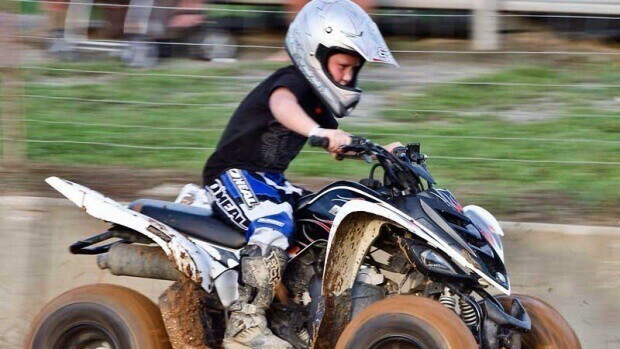 Begin by teaching your kid to simply start and stop the ATV. Then work on reducing speed when cornering. Place some light object such as empty soda cans on the wide flat ground so your kid can practice staying on course. Choose only routes you have investigated beforehand. You don’t want any unpleasant surprises. Keep away from paved roads. ATVs aren’t meant for them. They are not safe in case of collisions with other cars and vehicles and are difficult to control on asphalt or concrete. Do not cross deep water or water with a strong current. If you can’t avoid it, be very careful not to make any sudden movements, turns, and stops. Remember that wet brakes are much weaker. Teach your kid to avoid any reckless movements and decisions. Be a good example of that yourself. Keep an eye on your kid as much as possible. Don’t forget that, after all, the main reason for all that off-roading with your child is to spend a pleasant time outdoors together. Be smart and careful, and four-wheeler riding with your kids will bring you a lot of fun and joy. 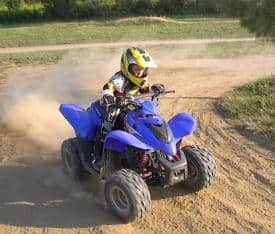 Is Your Kids Ready For ATV Riding?